Prolong the life, vibrancy and intensity of your hair colour with Fudge Colour Lock Conditioner. This intense moisture-infused conditioner protects hair against UV damage and reduces colour fade resulting in longer lasting intense colour. 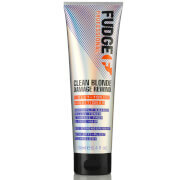 Fudge Colour Lock Conditioner contains specially designed cationic conditioning polymers that reduce drying time. Plus its unique Puricare ingredient is designed to prolong your hair colour and keep it more vibrant. Puricare has a special anti-pollution formula that protects your hair from environmental grime, such as UV light, pollution, chemical and thermal stress.